Lulu Bug Jewelry's handmade silver Hiking Boot pendant necklace is a gift any outdoorsy woman will love. 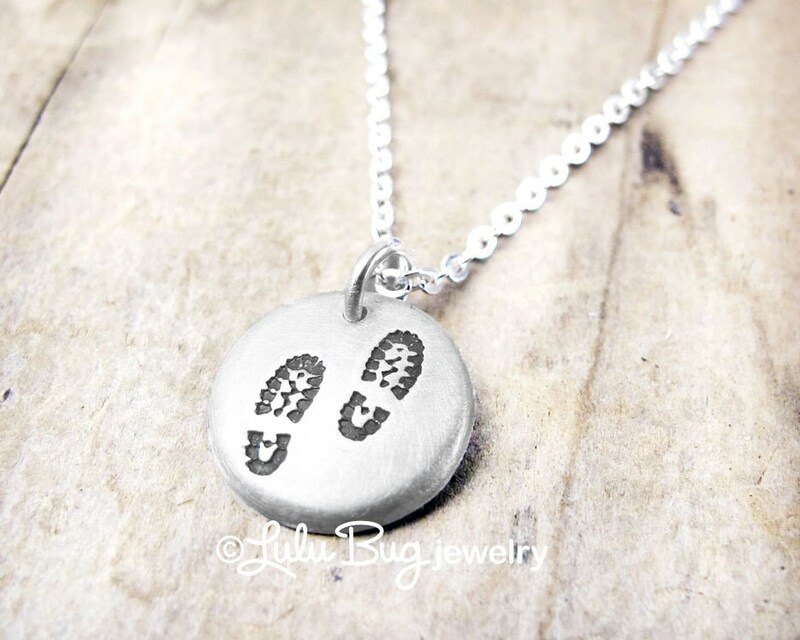 This handmade boot print charm necklace is TINY so it can be worn as everyday jewelry even for climbing, backpacking, camping or trekking. This handmade silver pendant is a meaningful gift for her that will last forever. - This is a TINY pendant about 3/8" or 11mm. it has a matte finish. Please see all images. - Your charm is made from .999 pure silver which is eco-friendly as much of it is reclaimed. - Lulu Bug Jewelry is entirely Handmade by me, starting with my original drawing. I make my own stamping tools and create the pendant using traditional silversmithing techniques. - The chain and jump ring are .925 sterling silver. It is strong but delicate to compliment the pendant. All of my jewelry is nickel free. - Your choice of 16", 18", 20", 22" or 24" sterling silver chain. - Your necklace is delivered in a gift box made of recycled materials, tied with a raffia ribbon and ready for giving. - The photo of the necklace shown on the model is for size purposes only and may be a different design. - Please refer to a ruler to confirm this is the right size pendant for you. - Lulu Bug Jewelry is individually made by hand, so your piece may vary slightly from the photo. - This piece makes a high-quality and meaningful gift that she will love forever! I gave this as a birthday gift to my sister, she loved it! Perfect. Just as described. Thank you!